198 pages | 14 B/W Illus. In the twenty-first century technology has become global, and firms compete using knowledge and capital. The ‘traditional firm’ has a need for innovation and depends on efficient knowledge management to improve productivity. This book examines five firms that produce the same commodity, white chicken meat, in different parts of the world and under very different conditions. 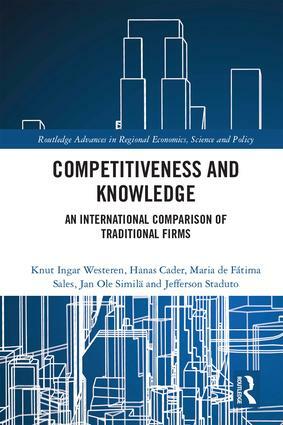 It brings to bear the expertise and international perspectives of the author team, utilizing theoretical discussions and case studies to address the question: How do local firms use knowledge to compete in an increasingly globalized world? This book will be of interest to any postgraduate student, researcher or policymaker hoping to achieve a firmer grasp of innovation and knowledge management: a recurring and highly pertinent theme in contemporary economics. Knut Ingar Westeren has been a Professor of Economics at Nord University in Norway since 2001. He received his Master in Economics from the University of Oslo and his PhD in regional science from the University of Minnesota/ NTNU (Trondheim). He teaches knowledge management, knowledge and competitiveness and public economics at Nord University and he also teaches philosophy of science at EDAMBA (European Doctoral Programmes Association in Management and Business Administration). He is professor at UNIOESTE in Paraná, Brazil, and a visiting professor at the University of Wisconsin. He has numerous books and publications dealing with several aspects of the public sector, regional development and the knowledge economy. Hanas Cader is Associate Professor of Economics at American University of Kuwait, where he has been a faculty member since 2008. He received his Master of Business Administration from University of Peradeniya, Sri Lanka, and Master and PhD in Agricultural Economics from Kansas State University. He teaches economics, economic development, knowledge economy and labor economics. He has published many journal articles and book chapters related to regional economic development, entrepreneurship, knowledge economy and e-learning. Maria de Fátima Sales has been a Professor of Economics at the State University of Londrina (UEL), Brazil, since 1995, where she is working with the Graduate and Postgraduate Program in Regional Economics. She has her PhD in Economics from the Federal University of Pernambuco (UFPE), Recife, Brazil. She teaches international trade and international finance. Her primary fields of research are international economics, labor market analysis and regional economics, where she has numerous publications. Jan Ole Similä has been an Associate Professor of Organization Theory at Nord University in Norway since 2009. He received both his Master in Public Administration and PhD in Organization Theory and Management from Copenhagen Business School. He teaches contract economics, contracts management and procurement management at Nord University. He is also a visiting scholar at Kristiania University College in Oslo, Norway. He has several publications dealing with contract management, contract economics, procurement management, and knowledge management. Jefferson Staduto received his PhD in Economics from the University of São Paulo (USP), Brazil. Since 1995 he has been Professor in Economics at State University of the West of Paraná (UNIOESTE), Brazil, where he is working with the Postgraduate Program in Economics and Regional Development and Agribusiness. He is also visiting researcher at the University of Rhein Waal, Germany. He teaches macroeconomics, labor economics and rural development. He has several publications dealing with labor market, regional and rural economics, and gender and development.